There are two species of native pigeon – the New Zealand pigeon (Hemiphaga novaeseelandiae), known also as Kereru, and the Chatham Islands pigeon (Hemiphaga chathamensis), known also as Parea. Kereru are large birds that can measure up to 51 cm from beak to tail. They can weigh around 650g. They are easily recognised by their iridescent green and bronze feathers and bright white chest. They are long lived birds that breed very slowly. Normally a pair will lay a single egg in a roughly constructed platform of twigs (the kids game “Pick – Up Sticks" is probably a more stable platform than what a Kereru builds!) in spring/early summer. Incubation of the egg lasts 28 days. Kereru are known for their spectacular flight displays during breeding. Since the extinction of the Moa, the Kereru is the only bird with a beak large enough to swallow fruit larger than 12mm in diameter and disperse the seeds again whole. Native trees such as the karaka, taraire, tawa, miro and puriri depend on the kereru to carry their seeds to new areas of forest. If Kereru were to become extinct it would spell disaster for our native forests. 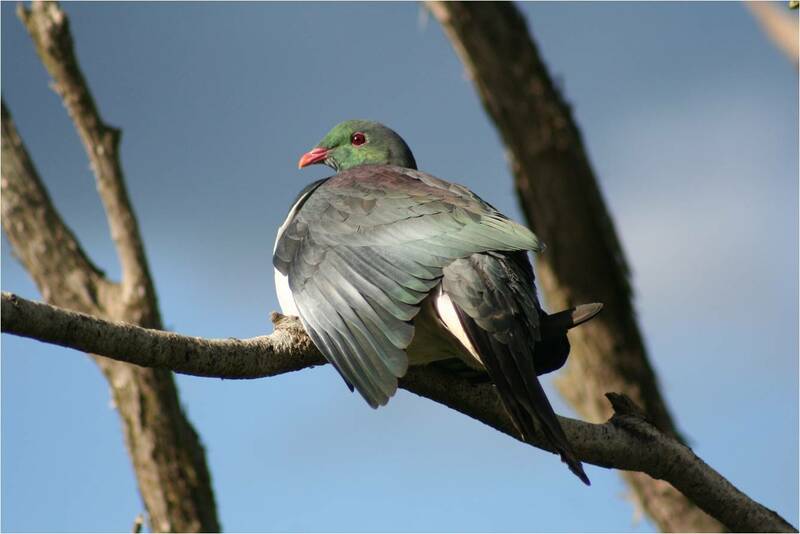 Kereru were traditionally hunted for meat and feathers but this is now highly illegal. Harming a Kereru can result in a charge under the Wildlife Act of hunting a protected species. It is an offence under the Act to hunt or kill a Kereru. "Hunt or Kill" includes taking, trapping, capturing, pursuing, disturbing or molesting a Kereru (it also includes using dogs or firearms). It is an offence to be in possession of eggs, and to disturb or rob any nest. The penalties in relation to absolutely protected wildlife are up to 6 months jail or up to $100,000 fine plus up to an extra $5000 for each extra bird/egg. The wing beat makes a distinctive sound and Kereru an iconic species of New Zealand. Click here to hear a song called "Kereru" by Levity Beet.